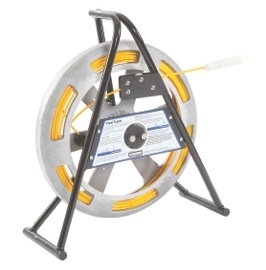 The FlexiTrace reel holds 164’ (50m) or 260' (80m) of small diameter rod. The rod can be energised by a Radiodetection transmitter* and inserted into pipes as small as 12mm. It is used with a Radiodetection locator to find and trace small diameter plastic pipes etc. *When using a Tx-3 or Tx-10 transmitter, some power restrictions apply. Please enquire for details.